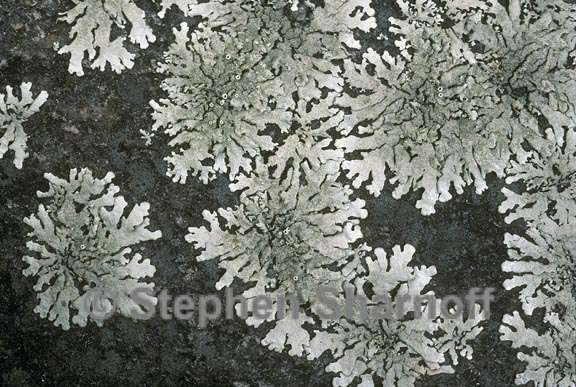 Thallus: foliose, adnate to loosely adnate, 4-10 cm in diam., irregularly lobate lobes: subirregular, elongate, plane to subconvex, separate, contiguous to somewhat imbricate, (0.5-)1-2 mm wide, not lobulate; apices: subrotund, smooth to crenate, eciliate upper surface: yellow-green, smooth, shiny, epruinose and emaculate, moderately to densely isidiate isidia: abundant, initially globose, soon becoming cylindrical to irregularly branched, 0.08-0.15 mm in diam., 0.1-0.5 mm tall; tips: syncorticate, dull brown, sometimes weakly erumpent; soralia and pustulae absent medulla: white, with continuous algal layer lower surface: pale to dark brown, plane, moderately to densely rhizinate; rhizines: pale brown, simple to furcate, 0.2-0.6 mm long Apothecia: rare, substipitate, 2-7 mm wide, laminal on thallus; disc: cinnamon-brown to dark brown; margin: smooth, pruina absent asci: clavate, 8-spored ascospores: hyaline, simple, ellipsoid, 9-10 x 4-5 µm Pycnidia: rare, immersed conidia: bifusiform, 5-6 x 1 µm Spot tests: upper cortex K-, C-, KC-, P-; medulla K+ yellow to orange, C-, KC-, P+ orange Secondary metabolites: upper cortex with usnic acid (major); medulla with stictic acid (major) constictic, cryptostictic and norstictic acids (all minor), and peristictic and connorstictic acids (both trace). Substrate and ecology: on acidic rocks, often in open, arid habitats World distribution: North and South America and southern Africa Sonoran distribution: occasionally at lower elevations in Arizona, southern California, Baja California and Sonora. Note: Heretofore X. plittii was the only isidiate species with a brown lower cortex and stictic acid as the major medullary metabolite recognized as occurring in the Southwest (Nash 1974b). A re-examination of the specimens and new collections established that both globose isidiate and cylindrical isidiate populations are present. The desert populations are much more narrow lobed, typically have globose isidia, which may become erumpent and are better placed in X. subplittii. At intermediate elevations in forested habitats X. plittii is more common. Both species range southwards into South America where a third species, X. succedans, is also found, but that species typically has minor amounts of peristictic acid that is not found in X. plittii or X. subplittii. See Nash et al. (1995) for a more extensive discussion of the three species.